After your arrival at Puerto Maldonado Airport where your professional guide will await you, we will go to our office to obtain the official waterway permits. Meanwhile you can visit the town’s main square and also take some photos of the beautiful scenery overlooking the confluence of the rivers Madre de Dios and Tambopata from Grau square. After a 40 minute boat ride we will arrive at Corto Maltes Amazonia. After having you welcome cocktail you can enjoy the delicious international dishes that the Lodge offers. After that you will have some free time to get comfortable in your bungalow overlooking either the river or the jungle, or simply take a refreshing dip in our pool. At 3:30pm it gets time to have some first contact with the Amazon jungle. You will always be accompanied by you guide who will show you tropical trees, medicinal plants and the abundance of nature in the 60 ha concession that Corto Maltes Amazonia guards. 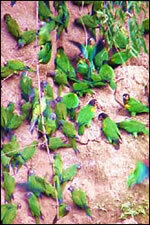 From our lookout you can observe toucans, macaws and other species of birds upon your return for sunset. The time of this trek is between 2 and 3 hours. Entrance to the protected area of Tambopata (INRENA TAX) is USD 12 per person, International or domestic airfares, airport departure taxes or visa fees, excess baggage charges, additional nights during the trip due to flight cancellations, alcoholic and non-alcoholic beverages or bottled water, snacks, insurance of any kind, laundry, phone calls, radio calls or messages, reconfirmation of international flights and items of personal nature.